When this notch-back Mustang loses control it slams nose first into the cement wall, catapulting the hood right at a photographer standing on the other side. Luckily for him, he ducks out of the way a split second before the Fox Body’s hood came flying at his head. Milan Dragway located in Milan, Michigan is home to many drag racing and other events April through November with this crash occurring on May 4th during the “Detroit vs. Chicago, Motor City Mayhem” Outlaw Street event. 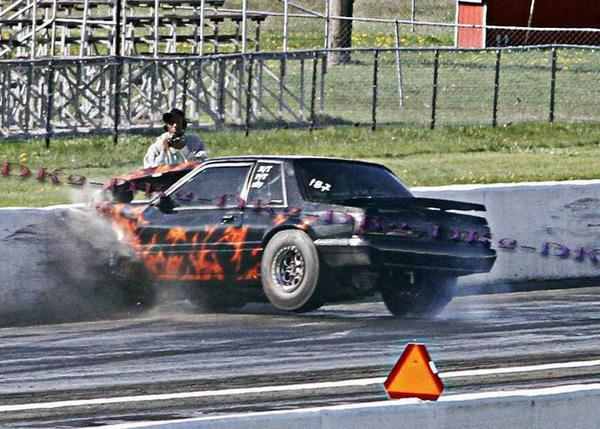 The Mustang Source brought this scary crash to our attention–a small block Fox Body hits a shot of nitrous before losing control and slamming into the cement wall, knocking out the driver. Luckily, the camera man was not hurt and the driver was taken to the hospital for observation over what appeared not to be serious injuries. It goes without saying, this could have been much worse given the speed of the crash and flying piece of death metal headed straight for the defenseless photographer. Now we can just be sad about the busted Fox that needs a new hood, among other things. We’ve all seen close calls at the track before, but I think it’s safe to say nothing beats a wheel stand wipe out. I was racing on Saturday and seen this crash. Poor car. “flying piece of death metal”? Don’t know the name of the driver before posting his crash?? His name is “Biz” a well known grudge racer. Also the hood was a mile from the photographer, but you say he was nearly decapitated.. Nice article!…. Not hardly! Do your research before posting. This wasn’t posted as bad publicity for the driver, nor is their a need to bring attention to a specific person involved–just a fast car and a crazy crash. Accidents happen, this one happened to be caught on film, involved a great looking and fast Mustang (two things we’re big on) and luckily did not involve any life-threatening injuries. I’m going to have to disagree on the distance between the hood and photographer, but video can be deceiving.